Make no mistake, "The Heat" is definitely a bold step forward for representations of women in film, and I'm sure you'll be hearing plenty about how Paul Feig's "Bridesmaids" follow-up is a cinematic landmark. It’s the first buddy cop movie starring girls! It’s proof that the glass ceiling is cracking, genre lines are blurring, and “Bridesmaids” made its mark with studio honchos. It’s a post-feminist film world, everyone! Some of this is undoubtedly true. It is gratifying to see female-driven comedy, and there is a thrill in seeing two talented women tackling a typically male genre. Be that as it may, sight unseen I can’t help but see “The Heat” as a consolation prize. The reason “The Heat” seems like something of a let down is that we have yet to enjoy a Dirty Harriet. There was a time when it seemed she would appear thanks to characters such as Clarice Starling, Dana Scully, Lethal Weapon’s Lorna Cole, Holly Hunter in “Copycat” and even Angelina Jolie in “The Bone Collector." It felt like cinema was finally acknowledging that women did carry badges, guns, and could hold their own on the streets. (Yes, I know two of those characters are FBI Agents, but it’s a variation on the same job, and I am trying to be generous.) The movies were catching up to real life. I feel like “The Heat” springs a lot from this tradition, rather than the cool and competent sarcasm that brought us Riggs and Murtaugh or Tango and Cash. 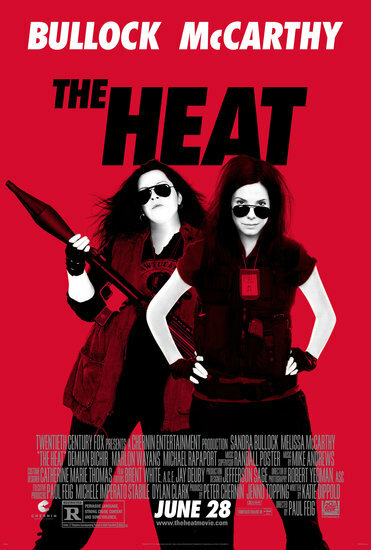 The movie is sold on images of Sandra Bullock and Melissa McCarthy being ungritty – despite the marketing’s insistence on McCarthy being the toughest cop of her station – and the laughs come from their inability to pull off the things Axel Foley could do in his sleep (to be fair, McCarthy is packing a rocket launcher on the latest poster). To add giggles to girliness, they can’t handle the sight of blood! WOMEN! They just fall apart at a little injury, whereas you can pump Stallone full of bullets, and he’ll laugh it off alongside the audience. Badasses take bullets; ballerinas break beer glasses and shriek. It's important to stress that “The Heat” isn't the problem, and I've heard reports from those who have seen the film that it's refreshingly assured in its empowering message, and nimbly avoids the traps that might make this yet another frustrating exercise in faux feminism. Even so, this isn't shaping up to be the Lady Lethal Weapon the world has needed, Paul Feig's film playing instead like a female version of “The Other Guys,” a satire that benefits greatly from a sturdy genre tradition. We're getting the satire without the subject, dessert before dinner, and so "The Heat" seems like swan song for a cinematic corner we never got to actually have. If we never got our Dirty Harriet, will a film like “The Heat” ensure we never will? Can you go gritty with a female cop protagonist after you already went goofy with her? That’s hyperbole, of course. Action comedy cops didn’t kill the police procedural, and never will. But “The Heat” may make it that much harder for studios and audiences alike to take a female-driven version seriously. After all, they haven’t been willing to do it before they shoved her into slapstick and Spanx jokes. Why would they be willing to now?